Topics: News/events, Addys, Job Bank, Aaf-cedar Valley Board, Committees, and Upcoming Events. 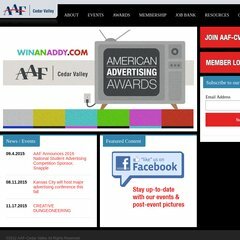 aafcedarvalley.com ADDY Winners Press Release Advertiser Awards Entry Entrant The AAF .. The estimated 37 daily visitors, each view 2.10 pages on average. Amazon.com Inc (Washington, Seattle) is the location of the Microsoft-IIS/6 server. resolvethis.spinutech.com, and ns1.spinutech.com are its DNS Nameservers. ASP.NET is its coding language environment.